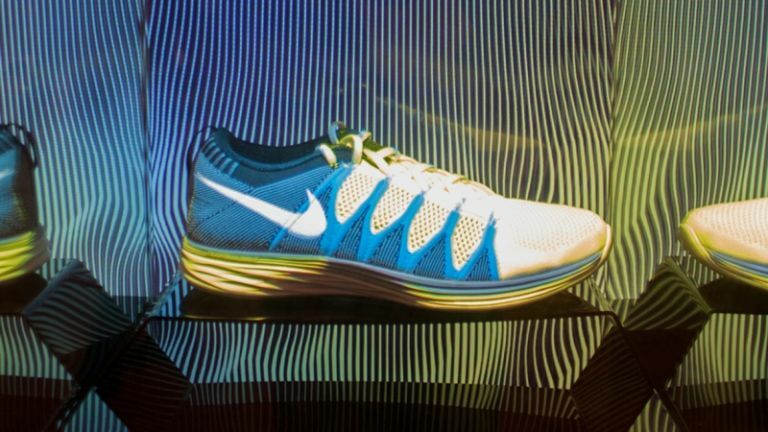 A highlight of Future15 at London's Flux Innovation Lounge, a showcase of leading edge ways to flog you new stuff, was Projection Artworks' Display Mapping, which allows easy viewing of Nike's innumerable trainer colour schemes. Projection Artworks' tech, also seen on an in-store-style display here - again, those visuals on the shelf are animated projections, not embedded screens - gives a relatively affordable, remotely-controllable (you can reset it via SMS!) approach to "mapped" projection, which follows the contours of any object, from well wicked sneaks to the front of a building to, well, a shelf. Also highly impressing us as we stumbled round clutching a glass of slightly rough Sauvignon Blanc were DigitalBridge and Cimagine. These are pretty much rival AR products - DigitalBridge lets you place furniture into rooms "live", then walk around and view them it from any angle; Cimagine places virtual wall and floor coverings, plus furniture to an extent, into photos of your rooms. You can then share the results with social followers, spouses, designers, Wallpaper magazine, etc. Unlike previous apps along these lines, neither require a "marker" in order to work out scale, and more importantly, they both seem to actually work in a non-glitchy and useful way.DigitalBridge lets you move around your room viewing new chairs from any distance or angle as if they're actually there – more or less, at 10x better quality than the competition. Cimagine flows new, virtual wall coverings into your room's photo, keeping light sources and flowing it behind radiators, furniture and so forth. Both are in talks with everyone from John Lewis to, er, Littlewoods so expect avoiding life-changingly bad furniture and paint/wallpaper decisions to get that much easier in 2015. Then there was this robot that mimics your movements - even challenging passers-by to dance-offs. Finally there was an Oculus Rift game ("pull" your way through multiple universes in Collider) and an absolutely massive touchscreen (from LG in this case), because there always is at things like this. A cracking event, in short, to which you can't come, because it's invite only.